This Christmas Pallet subway art is one of my all time favorite Christmas crafts. This is also the project that I am frequently asked if I sell these. * Update 12/1/13 – Congratulations to Kristy R. and Katie B. on winning this fabulous giveaway! Each have received a hand painted Christmas pallet and an OPC T-shirt! I love making pallet art mostly because the options are limitless and they are so inexpensive to make! 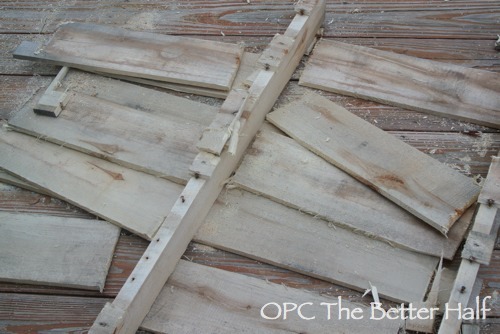 Be sure to check out my full tutorial on deconstructing pallets and building pallet signs. With this pallet sign, I used cut up planks from a pallet I found at the Goodwill (for free) and braced them together with a very old bottle of wood glue. It worked great but using screws takes away the dry time and is more secure, I just didn’t have the right length screws on hand. I took to Pinterest for some inspiration, finding a really cute subway art printable. Unfortunately, the pin led “nowhere” – it was just a picture. So if anyone has seen the original creator of this, let me know so I can give credit! There were lots of similar subway art designs out there with the same elements – using different words to create the image of a Christmas tree. I free-handed the design onto the pallet using a pencil first, but if doing a smaller project, you can print out the design on your computer and use carbon paper to transfer it onto the pallet. I painted the design using a small brush and white acrylic. If you aren’t great with a paint brush, paint pens work great too. After the paint had dried, I sanded the entire pallet to create a more vintage look. 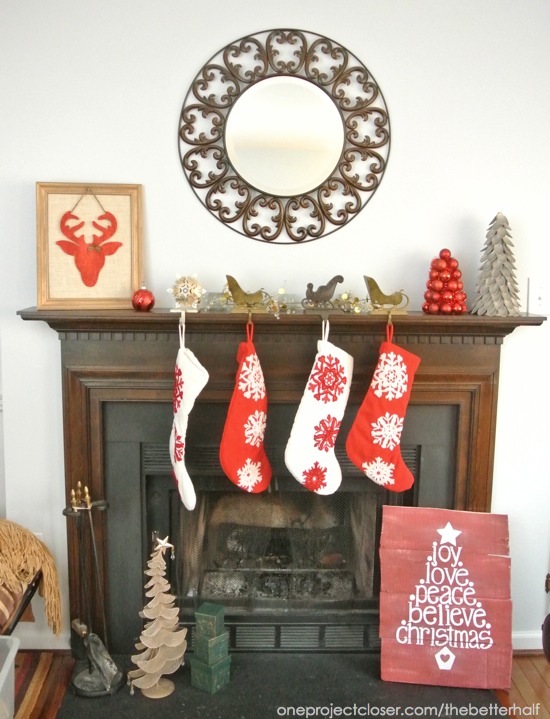 Here it is sitting by my fireplace last Christmas – LOVE! I made two smaller versions, approximately 10×12″ to give away! woot woot! Both are hand painted and distressed, on scrap plywood. You can enter below through Rafflecopter through Novemeber 30, 2013 at 11:59 pm. Good Luck! 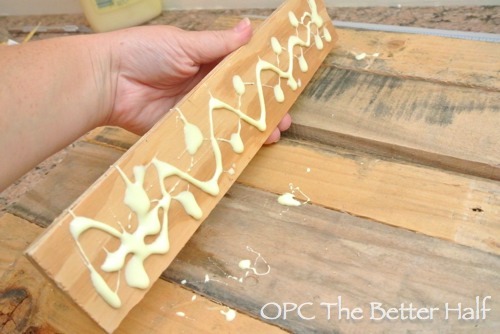 Now you know how to make the pallet, but also find out how to make your own Plastic Spoon Christmas tree! As Always, thanks for reading and showing us so much love on this ! Don’t forget to check us out on Facebook and Pinterest! I would keep it – LOVE it!! I love the sign! Great job, as usual. i think it’s perfect and I love it! Thanks Kim, Its my favorite piece this Christmas for sure! Thank you so much for sharing- loved it from the moment I saw it yesterday on the fireplace pic! Oh Jocie! This is so beautiful! I really love it! I love a good pallet project and this is a great one! Nice job! Of course it’s a success!! 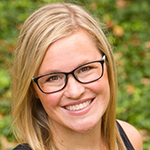 I’m a new reader- love your blog! I’m a last minute/don’t plan ahead enough crafter so this gives me hope! 🙂 I was wondering how you cut the pallet apart? Thanks!! Hey Natalie, I used a Ridgid Reciprocating saw to cut down the sides of the supporting beams. I had spend about an hour trying to deconstruct the pallet and preserve its length but it was insanely hard. So i just cut it up. I have used a small reciprocating saw in the past but it was slow work. This time I used the big guy and it was quick!! Glad to have you as a new reader! I LOVE it!!! It was my fav project from ND’s blog post about Girl’s Craft Night. Now I want to get my hands on some old pallets and get to work. Excellent work!!! That is a huge success!! Love it Jocie and those kids are totally cuties! First off LOVE this!! 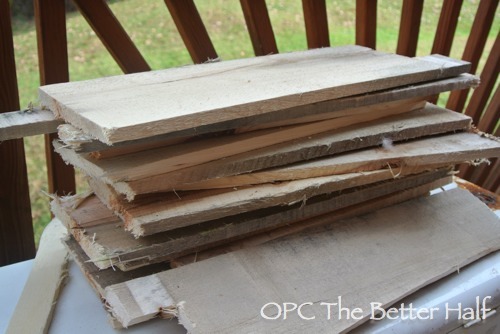 Second, you may have mentioned it in the blog but what are the boards being glued onto? is it the long post in the first pic or is there a flate piece they are being attached to? Looks great. You are well ahead of our house in terms of decorating for Christmas. We have our tree, but that’s about it. hahaha, I feel so behind! I’m only showing you the small section I have decorated! I think that is absolutely adorable! And hey, it comes with a funny story, which makes it even better! Stopping by from the Happy Hour Linky party! Thanks so much Stephanie and thanks for stopping by! So you basically freehanded the letters? Very impressive. I think it looks great, and I love the look that sanding gives it. Do you ever use that fireplace? I love it! Bigger is better in my book. And the red is great. And don’t you hate it when those pinterest links go nowhere? Definitely a success!! I love it. HUGE success!! It’s rustic pallet Christmas craft perfection! Thank you so much for linking up! that sign is fabulous! i love the rustic look the pallets give it! Definitely success!! I love your pallet sign, perfect for the season. Saw you sharing at The Space Between’s A Crafty Christmas. Thanks so much for visiting, Debbie! I love Space Between! I think it looks totally amazeballs! You for sure didn’t embarrass yourself! Thanks, Gwen. I didn’t embarrass myself with my art but i’m sure i said something inappropriate at some point! lol! I want to make one. & those little ones are adorable! Thanks, Theresa, and thanks for stopping by! Ooooh! I just love how this turned out! Pinned and featuring tonight! Thank you so much for sharing your creativity at Mom On Timeout. Hope to see you back tonight! This is definitely a success! I love it. Saw that it is on craftgawker. Congrats! This is gorgeous. Saw it over at one Artsy Mama. I’d be tickled pick if I could make something like this!. Nice thats the same bottle of Carpenters Glue my father had it would probably be around 35 years old now too. Great stuff I was looking for it this year I was so sad when I could not find it. Nice to see that bottle again! What a cute project, but I have to tell you your children, as always, steal the show! This is definitely on my list to make for next Christmas. Jocie – LOVE this!! Fingers crossed that I win so I can add it to my rustic winter woodland dining room! I love this! And I hope I win too! I love the font on that sign. And no way, if I win, I am totally keeping it to myself! I would love to keep it… but I will give it away because I am going to try to make one myself! Rustic is my decor of choice this Christmas. Would love to add this to my home decorr. Thanks for the opportunity. 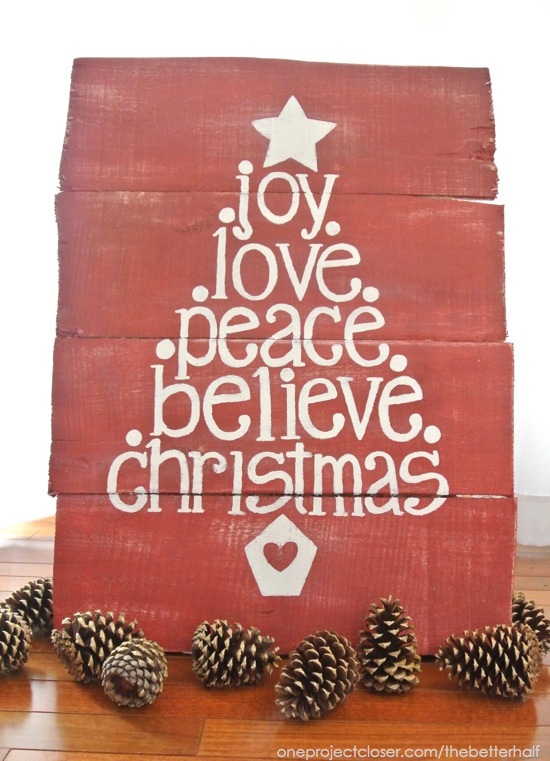 Love the pallet….so Christmas -y. Perfect for my rustic Christmas this year! love this – thinking this will live on my enclosed porch to greet our guests and welcome us home. and perhaps i’ll take this inspiration to make one, or two, or more as gifts! so cute! i am totally into red this christmas! This is great! I love the reindeer silhouette too!! Love the subway art project! It would make a great addition to my Christmas decor! I love your project–and I am a little ashamed to say I would keep it for me! I’d definitely keen this to myself! It’s adorable! love LOVE it!! I’ve been looking for something like this and would LOVE to win it!! I love this I’m headed to Goodwill today! I love it…and if I won; I would give it as a Christmas gift! I would totally keep it for myself! That thing is gorgeous! This is SOOO cool! I think I saw it first at your craft night with Naptime Decorator, if I’m not mistaken! This is so beautiful, rustic and classic all in one!! Hope I win!! I would give the sign to my daughter. Would love to make one myself, just got to find me some pallets! I would love to have this. Most of my Christmas décor got destroyed so this would be a great start for me this year. I just discovered your fab. blog thru Hometalk and I can hardly wait to spy thru all your DIYs! 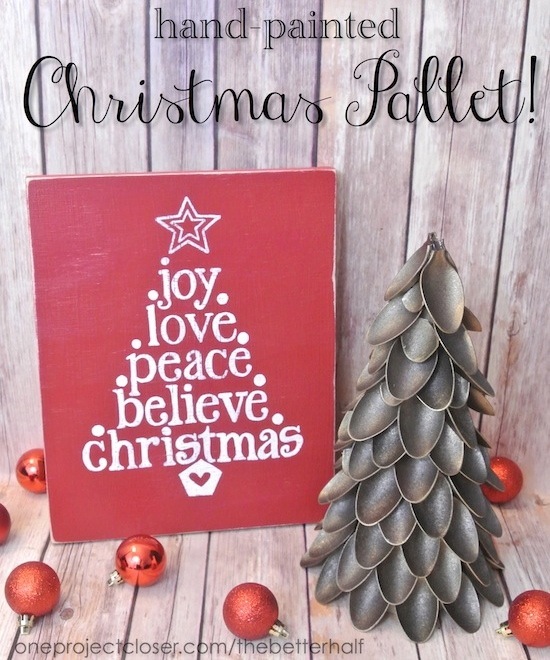 I love this Christmas pallet greeting you’ve made and I KNOW WHEN I WIN IT my neighbors will too! LOVE this! Glad to discover you! I would have to keep it. I love these and would keep it for my very own, but would love to try to make some. Thanks for the tutorial and the opportunity!!! I adore your subway art and would love to win it! I would totally keep it! We just moved into a new house so I would totally keep it! Love this project! Thanks. Love this! I would keep it. Love this, I would definitly keep it!! Hmmm…tough call. 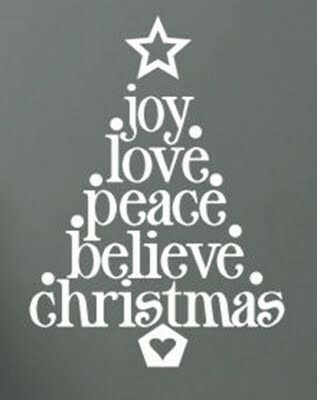 I think I would keep it and display it on our front stoop since we are painfully lacking in Christmas decor out there! Thanks for the chance. I would keep it, it’s so beautiful!!! Love it! I’ll keep it! Since I’m living with my sister, we’ll share it! Oooh, this is a toughie… this is super cute, and it would fit perfectly with my silver & red decor, but I think a friend of mine would love it, too! Definitely LOVE it!!! You are SO creative. So awesome as always!! Entering to win! I think I would have to keep it. It’s so perfect! I think I would have to keep it! It’s lovely. I think I’m going to be selfish and keep it for myself! My sister’s birthday is in January so I might actually gift this cause it’s just her style!! TY very much! I would so keep it for myself! I know a lot of friends who would love it, but being honest, I would probably keep it myself! What color paint/stain did you use for the red?? I love this!!!! What font did you use? It is so perfect. I am glad I found your post cuz I did the same thing with the picture one. Ugh!!!! I also have an old thing if glue, but it still works, just add Syran wrap to the lid to keep it sealed. Thank you!!!!! Get the Latest News and Printables! Sign up and receive exclusive printables only for subscribers. Plus we'll keep you up to date on our latest posts!